Rocky is looking for his forever home! 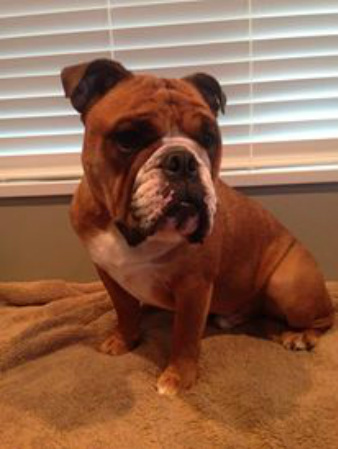 Rocky is an English Bulldog!. Rocky is just over a year old and looking for his forever home. Rocky is neutered, micro-chipped and full-vaccinated. Rocky is a smart young guy and knows some his basic commands but still needs some basic obedience training. Rocky loves to chew on this favorite toys. He loves going to car rides. Rocky is NOT a couch potato but can be after some good activity. Rocky is looking for an calm home where he is included as much as possible. Rocky has great doggie skills and gets along with other dogs and he loves people. Rocky might be too much for small kids as he does like to jump on people to give kisses. Rocky doesn't want to live with cats in his new home. Rocky is in good health but has a Grade 4 heart murmur that doesn't require medical intervention at this time but could and most likely will in the future. So Rocky's future medical costs could be expensive with multiple ongoing vet visits and medications. If you would like more information about Rocky please contact Melanie directly. Check out Rocky's Photo Album below!